← Raleigh Women’s Rally calls for Gender Equality and More! 10,000 -15,000 determined, compassionate, and resilient North Carolinians poured into the state capital for the Women’s Rally on Raleigh on Saturday, 1/20/18. The Raleigh event was in conjunction with events in at least 9 cities around NC, and with all these people in all these cities celebrating women’s rights and raging against bad policies, against dangerous votes, against vicious political maneuvers, against terrible tweets and against worse behavior! 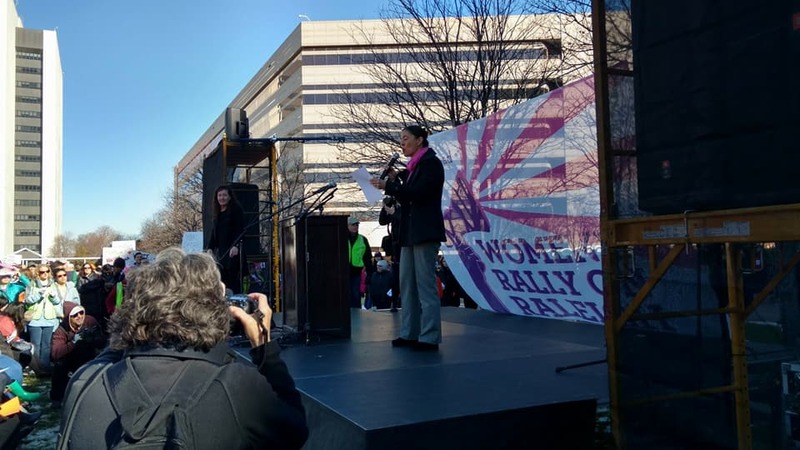 In Raleigh, women leading the resistance sang, recited, and spoke about voter suppression, sexual assault, domestic violence, access to affordable quality healthcare, immigrant rights, Islamophobia, LGBTQ rights, public education and more. Our rally cries rang across North Carolina​: ​the resistance is here to stay. Here are some quotes from our speakers and performers. See almost two hours of the event from right in front of the stage on WRAL here. -Eiman Ali, @EimanAliii, on the contributions of immigrants, and the scapegoating and abuse they endure. “Things I resist – oppression, discrimination, poverty!” – Performer Lena Jackson. “We have the opportunity to restore democracy to North Carolina” – Civil Rights Attorney Anita Earls​. “Remember, it is women who are leading this fight!” – Civil Rights Attorney Anita Earls​. “We will rise!” “Such a beautiful voice [Lexie has], I was hypnotized and forgot to record!” – Organizer Shana Becker wrote. “[T]o stand with women and to ensure that women know that we are equipped and are here to lead the resistance against oppression.” – Letha Muhammad, Education Justice Alliance. “I have the power and the agency to stand for my children in schools. But not just my children, for all children. So I’m out here today to encourage all of us, no matter what community you come from, to stand up against injustice.” – Letha Muhammad, Education Justice Alliance. “No parent should have to choose between a safe place to live & enough food to eat.” “Women & children are being denied the support needed to help them survive. Only 7% of women & children who need financial assistance receive it” -Ana Pardo, NC Justice Center. “Unfortunately it needs to be said. We are not leeches coming from shitholes.” -Eiman Ali, @EimanAliii, on the contributions of immigrants, and the scapegoating and abuse they endure. “This movement is long past overdue. In order to achieve our goals, we must acknowledge our privileges and take stock of our weaknesses and strengths.” – Speaker Nida Allam, from the NCDP. Thanks to WROR organizer Shana Becker for capturing many of these quotes and tweeting them to the world! Organizers expected 5,000 attendees and 2 to 3 times that many flooded into Halifax Mall. Event held on Halifax Mall. This entry was posted in protest, rally, women, Women's march and tagged protest, rally, women, Women's march. Bookmark the permalink.